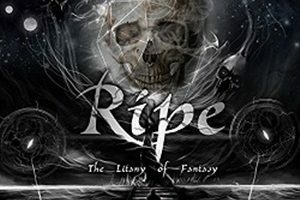 Six years removed from the last studio album The Eloquence of Silence, Danish melodic metal band Ripe return stronger than ever with their fourth full-length The Litany of Fantasy. It’s understandable that major life events (families, jobs, etc.) 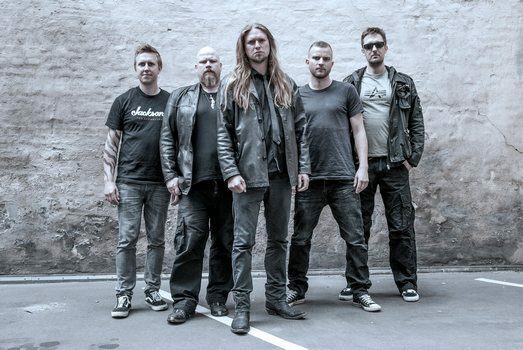 justify some of the hiatus, as well as vocalist Michael Bastholm Dahl joining one of the longest running thrash bands in Artillery – recording two albums in the interim plus several tours across the globe in support of those records. But the quintet felt the need to get this album out to the public- going the self-release route after finishing their contract with Mighty Music, and it’s a mighty effort of catchy hooks, solid melodies, and spirited songwriting that can be in the Judas Priest mold one minute, then rocking like Airbourne the next. Reaching out to Michael via Skype, we had a fascinating conversation bringing people up to speed on the new record, a video game that the band is also a part of, his time with Artillery and how he separates the two entities, plus a lot of discussion regarding education, literature, and the environment. Dead Rhetoric: The Litany of Fantasy is the fourth Ripe studio album, and first for the band in six years. What events and circumstances took place for the long gap between releases? Michael Bastholm Dahl: Well, one of the main reasons was that I joined Artillery just around the time that we were finishing the demoing of The Litany of Fantasy. Believe me, I would have had this album released far sooner if all things had been as they should have been. We decided we would record the album, and that was finished in 2014-15, around there. It was already recorded and done. We simply decided that we would go on a sort of hiatus because people were having families, procreating and all that stuff so we figured we might take a rest for a year. That ended up being three years instead. Dead Rhetoric: From what I understand, you recorded 17 songs and included 13 on the album, but put four of the songs for use in a soundtrack way for a video game. How did you decide what songs went for the album versus the game? Dahl: The 13 songs for the album were decided prior to the video game release. There’s nothing to do with the fact… I should say that the best songs came out on the album, and the leftover material – which wasn’t bad at all, but they couldn’t fit on the album as it would become too long. We thought maybe we would stack them until next time and rework them on other stuff, but then a friend of mine came along and wrote me, he was working on this one-man computer game project. I have to be honest- I am a geek and I love computer games, books, movies, and all that stuff. He told me about the game he was developing – it would have this retro, Ready Player One feel about it. I like that, so I told him if he needed some music I could surely send you some. He felt it would be great to have that in a spacey, science fiction, kind of sports game competition. I had some upbeat music, he was into it. One of the main reasons why it would be alright for us to do this – it would be background music, but if you really liked the track you could listen to it more extensively. Dead Rhetoric: Will there be a way for people to access that music in another format other than having the video game down the line? Dahl: I hope so. Obviously you can go on Steam and buy the game quite cheaply- I don’t think it’s very expensive. I think that we will release that material later on. I don’t see us spending too much time moving on now, as it is I know I have Artillery waiting and we are entering the studio in July, that’s going to have a late 2018/ early 2019 release. I cling to the hope and idea that we can deliver the next Ripe album maximum within the next two years. It’s called Zero-G the video game, it’s a small game. It’s not a huge online, MMO game, it’s a nice spare time little game. Dead Rhetoric: After two albums on Mighty Music, you decided to release this one independently. Do you believe this is the best route for Ripe to pursue – especially given your higher profile role within Artillery that can turn people on to your work for Ripe? Dahl: As it is right, I’m not sure that the independent idea was the best idea. I don’t know if we had another choice, because we wanted to try and control things a little bit more. I’ve grown used to the idea of having a record label behind you and backing you. As it is right now, I would like to make a physical release of the album- I do think this will be necessary to do. A lot of people have been writing me, it’s alright with the digital release but they would like to have a physical release too- and I couldn’t agree more, I would love to have the physical release too. If ever the possibility occurs that we can make a physical release with a label, I would love to do that. We decided to try this out, because the market as it is right now is quite difficult to figure out where we are going. We wanted to see what happens. I’m not sure whether or not it’s the best route to go, but that’s the way things go I suppose. Dead Rhetoric: What do you believe are the major differences in this record compared to your previous Ripe discography? What areas surprised you the most when it came to the songwriting, recording, or performances? Dahl: First of all, the main thing we wanted to do this time was to have more fun. To actually create a more straightforward, hard rock ‘n’ roll/ metal Ripe album. When we did The Eloquence of Silence, it was a lot of work. At the end of that process we agreed we wouldn’t do that again, as it was too tiresome. We were wearing each other thin. We can just have fun with things, and at the time we were listening to Airbourne – the Running Wild album a lot. I really like the recklessness of that first album, it saved my life (laughs). It was exactly what I needed in my life at that time- it was this true, old school rock and roll record. In no way were we trying to replicate that, but I wanted to make a more straight-forward metal-oriented album. What we aim to do to move as well into more aggressive areas – if something came out that was a little rougher, we left in on there as that’s what we are going to do. I like some of the moody stuff on the album – I try to lose myself in the material. We were writing the songs in quite a concentrated amount of time, it felt like a very concentrated and together process. What surprised me the most is listening to it afterwards, there are some songs on there that I couldn’t see myself right up front because I was in the creative flow, different kind of stuff came out. Songs like “Wail to No Avail” surprised me in a positive way. Dead Rhetoric: How do you approach your vocal takes in the studio – are you the type of person that does best at certain times of the day to get your best performances? Also, how prepared do you like to be when it comes to your workload – do you leave room for spontaneous, off the cuff takes? Dahl: I certainly leave room for spontaneity. It’s more important to get that kind of real feeling and real vibe conveyed when you sing (things). I don’t have a particular time of day I prefer- at least after midday. If it’s too early, I need coffee and books and gruppiness in the morning. What I need the most in the studio is actually positivity. I can’t work with people who are angry at me and think that this will make me perform better. It makes me angry and perform less than well because I’m more concerned with the things that annoy me. A good laugh helps, and the time to let myself focus on what I’m doing so I don’t need a lot of people there in the studio with me. I prefer just the producer and myself. Dead Rhetoric: Can you take us back to the time when you got the chance to join Artillery- as I remember from a previous interview that they discovered you when you were performing in a King Diamond/Mercyful Fate tribute night? Dahl: Yes- and it started out as a joke really. I have some friends that were doing a metal festival in Denmark, it was called Metal Magic – and they were inspired by the Pantera album. They wanted to go for an underground metal festival where you can watch old school metal bands and be curious, meet interesting, different kinds of bands. We were talking at some point of reviving the idea of doing a King Diamond/ Mercyful Fate cover band, because we had been talking about that for a couple of years. We have done one-offs where I had been simply doing the singing, but not the makeup and stuff. We went to this party, and some guy said that he had some human bones lying around, he found them on the internet. It was legal stuff that he had, stuff from people that had been studying medicine – it’s all good so to speak. We wanted to do the complete thing with the makeup and the clothing, so we did that for a one-off and I figured that was it. I really love that material, but it’s not necessarily so easy to sing, it’s hard on your vocal chords and I like to run around a little bit more. The rumor spread and people came out, they wanted to see more of this. We went to Germany, Greece, all kinds of places to play – and this festival was in the northern part of Denmark, right near the coastline. Very nice folks there – they phoned us and asked us to do this gig, and they told us we were going to play with other bands like Artillery, so we thought it was cool. That was the first time they saw me, but I don’t think I saw them that much. They were quick to leave. I was lucky that they heard me. Later on I got a text message from Michael. Dead Rhetoric: You’ve been the vocalist for legendary Danish thrash band Artillery since 2012. Where do you see your role and importance within the group, and what have you been able to learn and apply from your work there that aids Ripe to move up the ranks in the scene? Dahl: How you work with things, the dedication and what it takes. I’ve learned so much from Artillery to how things have gone up and down. Creatively I am far more sure of myself now than I was in the past. All of a sudden you find yourself four albums down the line and even more, you find a creative space that you are comfortable with. You move on from that, and that helped me a lot to sometimes vocalize the ideas that I didn’t try out before that. What it gave me in all of kinds of terms how to do things, how to work with people, and that’s what the Ripe guys all said to me when we decided to start up again. They felt that I should be taking care of some of the technical stuff, talking with bookers and managers because I have experience in it- and I said I would love to do that because I think it’s a cool aspect of the whole thing of being a musician. It’s two different kinds of animals, because Ripe is not necessarily aimed at becoming a huge internationally known band. We would love to, but we don’t want to force it. Artillery has a long history, a renowned history, and has a legacy to fulfill. You need to deliver this to know that you are doing it well. At the same time, Artillery is having a lot of experiences on their own as well. Overall, it’s been a good thing for Ripe for me to be in Artillery. Dead Rhetoric: How do you approach the older Artillery material when it comes to the live shows? Do you try to stay true to the melodies and the way the other vocalists sang that material? Dahl: I’ve got a lot of freedom. They are letting me do all kinds of crazy things at times. They give me a lot of trust to do things the way I do it. They’ve never said I have to be as close to the original singers as possible. If I have had a horrible night where my voice has not been so good, I’ve never had a single moment where I have had to take care of what they are thinking. They’ve always been supportive, and I also I feel a great deal of responsibility. What I’m trying to do is sing it as well as I can, obviously there are things I can’t do that the older singers were doing but I try to make it a hybrid between myself and what they were doing. It’s not me doing an impression, but me doing what I can to honor the older stuff. Dead Rhetoric: You are a teacher for a career beyond your music endeavors. What subjects do you teach, and how do you feel about the education system today compared to how things were when you were growing up – do you believe the youth has more advantages and technology at their disposal than ever before? Dahl: That’s a huge question. What I teach is Danish, English, and a little bit of philosophy as well. I studied that as well, once. I mainly teach linguistics. The idea of the youth having more tools nowadays to help them, I don’t know. I am quite satisfied growing up in a world without the internet and mobile phones, without this kind of hyper surveillance kind of society nowadays. Some of the main problems nowadays are just simply to having people pay attention- stuff is going on in their lives online, all these apps and friendships. I’m not surprised that young people are having more stressful lives, and suffer from stress because the demands are there all the time- even more maybe. You have to be great, you have to look great, you have to do interesting stuff, you have to have great grades in school too. I think at times we need to loosen up a bit and let people know if you don’t answer the phone, that’s completely alright. In the old days you could unplug your phone and then people wouldn’t be able to call you for a couple of days. Nowadays people are freaking out if they can’t get ahold of you in a minute, you know? Obviously there’s a lot of software and hardware that can help you, but I think the state of our education as it is nowadays is too focused on careers and the whole capitalism idea. You have to be money making and you have to be producing, whereas I think we are missing out on some of the scholastics. We are missing out on the whole idea of being who you are and studying out of passion. Just doing stuff for the sake of doing it- you don’t have to be focused on a goal all the time. One of the biggest problems is that the young people of today are doing everything that others ask them to do it- they are too tired to protest, they are studying more now than they ever have. In Denmark at least, the number of lessons have increased and I don’t see that as being healthy or beneficial. We don’t get innovative ideas by saying the same things twice or three times – you need space in your head. I won’t paint the picture entirely bleak, but maybe I’m old school. People should feel that spending time doing something completely less constructive isn’t destroying things. Sitting down and reading a book once in a while is okay – take care of your mental condition as well as your physical conditioning.